If you live in Ottawa-Gatineau (or even if you’ve visited), chances are you’ve spent some time in Gatineau Park. It’s beloved for hiking, cycling, cross-country skiing, camping, swimming and more. The National Capital Commission (NCC), which manages Gatineau Park, says conservation and environmentally-respectful recreation are priorities for the Park. Sounds like it’d be protected—but that protection is somewhat precarious. In recent years, organizations including the Gatineau Park Protection Committee and the Canadian Parks and Wilderness Society-Ottawa Valley (CPAWS-OV) have called for stronger legislation and action to protect the Park. The most recent threat is construction of a four-lane, 6.5 km extension of Autoroute 5 between La Pêche and Wakefield along Gatineau Park’s east side, which entails clearing 88 forested hectares within the Park. For the last few years, residents and environmental groups have asked the government to reconsider the extension plan, saying it will unnecessarily destroy the local ecosystem and old growth forest, and adversely affect the aquifer and local wells. A group of people called A5X has been trying to prevent the clear-cutting and draw public attention to the issue. They say they’re not trying to stop the extension, but wanted a one-year moratorium on construction to allow for an updated environmental review and an improved highway design. In January, a number of protestors moved into the area, hoping to stop provincial highway workers from clearing the land, but when tree-clearing began at the end of February, a few people climbed trees at the site. On March 1, several were arrested after Quebec’s Superior Court granted an injunction allowing police to arrest and charge those found in the area. Climbing pine trees and risking hypothermia and heavy fines might seem extreme, but people have tried other means to have their requests for more time heard. 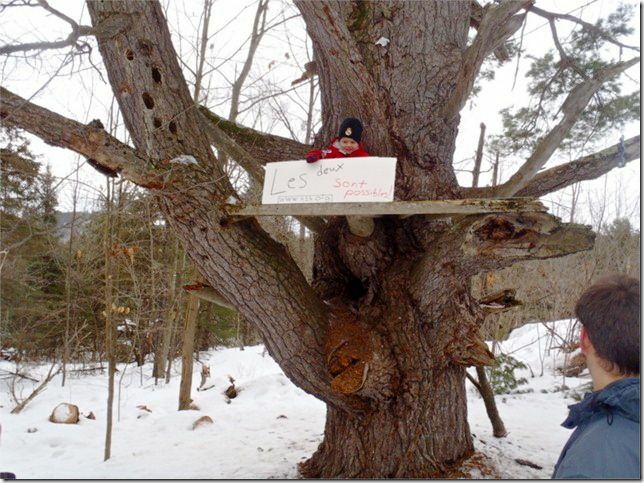 Some of the trees are now gone, but Sierra Club Canada suggests people still write to Quebec Premier Jean Charest. You can see A5X’s alternative proposals at http://www.a5x.org/bearing-witness–teacutemoigner.html and http://www.a5x.org/alternatives.html, and there’s a backgrounder to the highway extension at OpenFile Ottawa.